:Accommodating one or two children age 6 to 10 with plenty of working space with the Wild Zoo Student Desk in maple laminate. Crafted with a solid wood frame and a maple-look laminated top, this handy desk showcases rounded corners and a dent-resistant edge trim. The edge banding trim is available in 8 different color options. Included with a double-wide attached seat, this comfortable desk fits conveniently within any room or against a wall. A complementing addition to any décor. Wild Zoo is a family-owned company based in Oregon. Since 1995, the company has been making children's furniture entirely in the USA. 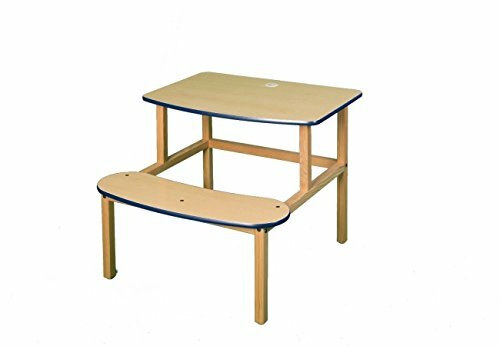 These kid-sized desks offer a large work space for desktop computers, laptops, tablets, art projects, and school tasks. Dimensions: 31W x 33D x 25H in.. Solid wood legs and frame, maple laminated top. Features an attached seat for 1 or 2 kids and dent-resistant edge banding. Recommended for age 6-10. Dimensions: 31W x 33D x 25H in. If you have any questions about this product by Wild Zoo, contact us by completing and submitting the form below. If you are looking for a specif part number, please include it with your message.